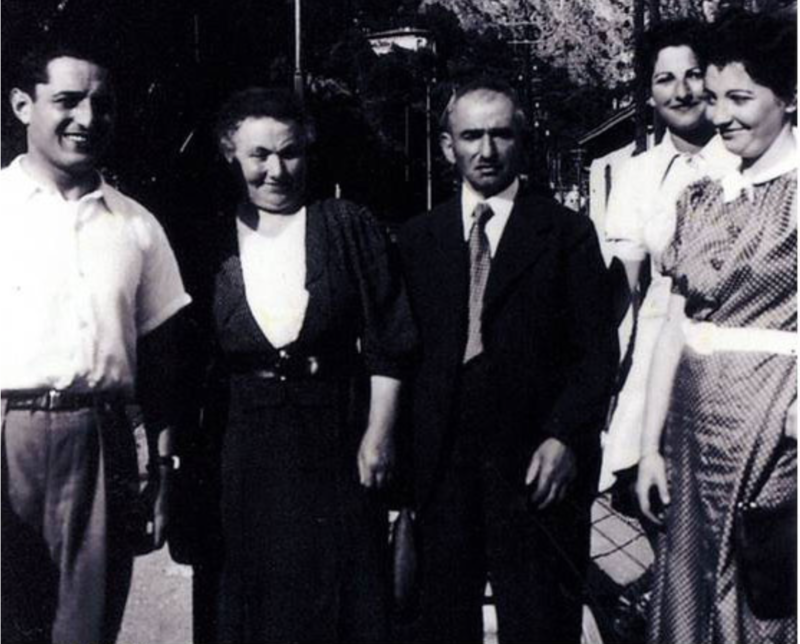 “In 1893, at the age of 13, my father Daniel Levy, also called in Bollendorf “Bäcker Dany,” left the house of his parents, Marx Levy and Caroline Schoemann, to start on his apprenticeship as a baker. For the first 3 years he travelled from bakery to bakery, from town to town, learning the trade as an apprentice and passing a test to become a “Geselle,” a Guild member. He continued traveling for another 10 years, crossing all of Germany, stopping in Kiel, Lüneburg, Ludwigshafen, Bremen, always learning new techniques and increasing his savings. He carried with him on his shoulder a wooden trunk with his work clothes, black and white small plaid pants, a white jacket and a small white cap like a sailor’s. Health regulations required bakers to wear shirts and caps at all times. He would come home for the Yontefs and the wedding of his sisters. When he was about 27 years old, Bäcker Dany came back to Bollendorf to settle down. His father Marx had a small piece of land on Linden Strasse, where our house still stands. He gave it to him and with his savings from all those years of work, he built the house. When he married my mother Mela [Melanie Cahen from Grosbous], her dowry helped finish it and pay the debts. At the bakery, work started early. The evening before, around 11 or midnight, Daniel would prepare the live yeast. At 4:00 a.m., the workers would start, but first would have some coffee, rolls, butter and jelly, whatever they wanted. At 8:00 a.m., they would stop for breakfast with cider, sandwiches with salami, eggs. They would make it themselves and did not mix meat and dairy. At lunchtime and in the evening, everyone, family and employees, would eat a full meal in the kitchen. The employees were all Jewish and lived in the house with Dany and his family. There was one big room upstairs for the employees. There was also a smaller room with a kitchen which was sometimes rented out. The employees could use the kitchen as a washroom. The store would stay open until we went to bed, 10 or 11 at night, as long as we had bread to sell. Late in the day, we would give it or sell it cheaper to the poor. To non-Jews, the bakery sold jelly donuts for Carnival, Stollen with candied fruit and ginger bread-type cakes for Christmas and New Year’s. For Schabbes, there would be Challa and Bershes. People would buy for 2 days because the bakery closed early on Friday afternoon. Sunday was a busy day, the bakers made pies, tortes, Viennese pastries, kranzen, brioches, kugelhopf in heavy cast iron molds. They had to work particularly hard during the night from Saturday to Sunday. On Friday afternoon, the apprentices would clean the bakery from top to bottom. Heavy white cloths were used to wrap the bread and they were then brought to the Sauer, the river in Bollendorf. They were put in the river and secured with heavy stones on the edge and left there until Monday. The current would wash away some of the flour. On Monday the woman in charge of the wash came. Each family in Bollendorf had a little space by the river in the grass with ropes to hang the wash, a flat stone to brush it and beat it on and a little wooden crate to kneel in. After brushing to remove the flour, the clothes were boiled, rinsed in the river and hung to dry. The wash woman would get a piece of the Schabbes Schalett every week, otherwise she refused to come. On Thursdays, someone came to starch collars, shirts, cuffs, napkins and tablecloths and iron the whole wash. The oven was heated with wood, but the kneading was done with an electric machine as of 1909. At Pessach, the bakery was cleaned and made Kosher and then closed for 8 days. It was a kind of vacation for us. The employees went home to their families. We sold Matzot and people bought for a week. One of our suppliers was a Marx from Rächtig who was a distant relative and had married Setta Sender’s sister Ida. There were several communal activities in Bollendorf which involved Jews and non-Jews, for example cider pressing and sauerkraut making. Cider was made in the fall at the communal press in the village. You had to make an appointment and 2 men would work the press, one pulling, the other pushing, it was easier that way. The first cider pressed was the best one for drinking, the subsequent pressings were used to make schnapps. There was also a communal alembic for distilling the cider and there too, you made an appointment to use it. We made 2 barrels of cider to last us for the winter. The other communal activity was sauerkraut making. There was a communal knife that was borrowed after you had reserved it for your day of sauerkraut making. After being sliced, the cabbage was layered in an earthenware pot with salt and juniper berries. A beautiful oakwood board cut to fit the opening of the pot was placed on top with a cloth covering the opening and heavy stones weighing the cabbage down, then the pot was put in the basement for a few weeks and we would have sauerkraut for the whole winter. We always had a heifer that we would fatten up with our leftovers from the bakery and with milk, and once a year we had it slaughtered by the butcher. The butcher would take the hind part of the animal and we took the front parts. We canned the best pieces and with the rest, Uncle Rudolph [Niederemmel, a maternal uncle] with his grinding machine made sausages, adding some fat and salt and pepper and stuffing cow intestines that you could buy from the Senders in Sant Wendel and which were very thin but sturdy. They were then dried and smoked and would last until next year. For insuring Kashrut, we had a Shochet, Uncle Isidore, Tante Marianne’s husband, and a Shomer. Leopold’s Levy (Gustav’s family) had a butcher shop for a while. Otherwise, there was a non-Jewish butcher who had subdivided his store in 2, with a hallway in between, one part kosher, the other treife. He kept the animals in his slaughterhouse. The front part of the animal would go to the Jews, the back to the Goyim. The butcher also sold pork, but had a kosher room and kosher knives. The shomer would watch the process to insure the health and quality of the animal. On Wednesday, the animals were killed and on Thursdays and Fridays the meat was sold. People bought for the whole week and salted it or put it in vinegar brine to preserve it. The shochet was paid by the butcher and had received special training to recognize if the meat was tainted, if the animal was sick with TB or some other disease, if there was something suspicious in the stomach. If that was the case, the whole animal was declared treife and could not be consumed by Jews, which was an insurance of quality. In general, if the animal was sick, the defective part would be removed and the rest sold, but not in the Jewish culture. If all the meat happened to be declared treife, the butcher was then in trouble and had to quickly contact Kalman, the butcher from Irrel who would send him a supply of kosher meat for the week. And reciprocally, if the same mishap happened to the butcher in Irrel, the Bollendorf one would help him out. The smaller animals, such as chickens, goats and lambs were sent to Uncle Isidore the shochet and he was paid something plus also received some meat. He did not make his living with that, he was also a cattle dealer, but he and Tante Marianne had 8 children and they worked very hard. The butcher would also give him a piece of meat once in a while. Tante Marianne grew vegetables in her garden and she also often came to help us at the bakery, so we would give her bread that was a little misshapen, she was happy to take it. When a baby boy was born, there was a small family celebration on the 7th day for his Bress Meale. The Mohel came from Trier. Boys had godfathers, usually the grandfather or the uncle unless they were already godfathers, who gave their name to the child. Daniel Levy, who was the oldest, was probably named after his grandfather Guedalia Levy from Aach, our common ancestor. For Daniel Mayer, an uncle had come from Hopstädten. Children got candy, adults cookies and a glass of schnapps. It was difficult to travel in those days, only the godfather would come from out-of–town. In the case of a baby girl, there was no godfather, but a naming ceremony, Hole Krash. The children of the village would assemble at the house, the baby was in her crib, the children would lift her several times and say: Hole Krash, Holekrash, Wie soll das Kindchen heissen? [How should we name this child?] . The father would shout her name. The girl did not get the name of someone still living. The children at the ceremony would get little bags of sweets. Bar Mitzvah was also a family celebration, the godfather and his wife might come and give a present to the Bar Mitzvah boy, a gold coin or a watch if they had the means, but there were no other presents given. After synagogue, there was a family meal. Girls did not do Bat Mitzvahs, although in Luxembourg they had a collective one, all dressed in white like for a Christian communion. There was no permanent rabbi in Bollendorf. There was, however, a Lehrer (a teacher) who taught the children, boys and girls together. They would come from Yeshivas, from Frankfurt or other cities. Once, there was a very short one who stuttered. We bugged him a lot, he did not last long. Often they were young men from the Frankfurt Yeshiva who were not in good health, with weak lungs maybe, who were sent to Bollendorf for a change of air and to recuperate. Because the community was not rich and could not afford to pay them a real salary, they would eat in a different house every week. One of them was unhappy with this arrangement and my mother, Mela, felt sorry for him and invited him to stay with us. We put a bed for him in the big room on the first floor with the bakery workers and apprentices and he took all his meals with us. We were spoiled, Renée and I, because he taught us much more than he taught the others at the Cheder, writing Hebrew, Jewish history. His name was Kalman, he stayed a long time and was happy at our house. The Rabbi came only for funerals and weddings. The regular and holiday services were led by the congregation, everyone knew the prayers and how to sing, men and women all sat together on the ground floor of the synagogue and sang together. The wedding of my parents, Bäcker Dany and Melanie Cahen from Grosbous, in Luxembourg, was the first one to be celebrated in the newly finished Bollendorf synagogue on January 3rd, 1911, following the mandatory civil marriage. It was a big wedding and had to take place in Bollendorf because there was not enough space in Grosbous. All of Mela’s brothers and sisters came with their future brides and husbands. Afterwards, there were not that many weddings in Bollendorf, Tante Betty’s maybe. It was easier to have them in Trier or Luxembourg where there was a Rabbi. Most of the Mayer boys had left Bollendorf already. When someone died, the community had to do “Metaach”. People met in the house of the dying and recited 2 prayers repeated 3 times and then finished with the Shema, once -- the men for a man and the women for a woman. The Hevra Kadisha was in charge of preparing the body for burial, closing the eyes, washing, cutting nails, wrapping the face with bandages and putting on the burial clothes. Candles were kept lit all the time and people stayed with the body day and night until the rabbi arrived for the burial. The women would stand watch during the day and young girls during the night. The same for men and young boys. The funeral was done usually pretty quickly, except if the Rabbi was delayed on the way. The men would build the coffin with boards, the carpenter always had some boards ready. No one could touch it, and it could not have nails, only wooden studs. The only nails used were to close the coffin shut and each man would hammer one in. The coffin stayed open until the burial, then closed; the body was covered with a shroud. The coffin was placed on a 4-wheel cart that belonged to the town and was pushed and pulled by men up to the cemetery, at the top of a hill. The whole community would follow, Jews and non-Jews as well. When Goyim died, Jews would go to the cemetery but not to the church service. The Rabbi would say prayers at the house and at the cemetery. Then for 11 months, every day, morning and evening, until the time the Metzeve would be placed, a minyan gathered, usually at our house because there were several men working at the bakery and wearing the Käppelchen, and very early because cattle dealers left for work very early. At night, if a man was missing for the minyan, people would go through the town looking for one. As soon as a young bride arrived, she would be prepared and trained to be part of the Hevra Kadisha and to help take care of the dead. It was the responsibility of all. The young wife was invited one evening at someone’s house and was told about the special customs and activities of the community. Besides the Hevra Kadisha, there was also the Lernen. It was a traditional get-together in people’s houses on a rotating basis. The newly married couples hosted a Lernen on the evening of Shemini Atzereth, on Hoshana Raba, and served cakes and schnapps to the men and liqueurs to the women who came later. There was also a Lernen every Schabbes after Schule, around 11:00 a.m, before the meal. The first house was Salomon Mayer’s because it was close to the synagogue, then the next week to Scholem’s, then to Marx and Caroline Levy (my grandparents), then to Abraham Levy’s (Bella’s grandparents), then Steinberger, then our house on Linden Strasse, then Bacha Max, then finally to Uncle Max’s house which was at the top of the town. The Lernen followed the location of every Jewish house going from the synagogue to the furthest and after everyone had hosted one, it started again at the beginning. Young boys preparing to be Bar Mitzvahed attended too. Shabbat in Bollendorf meant that women started cooking Friday afternoon for the evening and the next day. The traditional dish was the Krompren Shalett. You would eat the crust on Friday night and on Shabbes for lunch there would be a new one. People would bring their Shalett dishes to the bakery where the oven stayed warm, and they would pick them up before the meals. Friday night, the traditional dish was also boiled beef with the broth served as soup. For Saturday lunch, there was a Schabbes Goy who would heat the food and keep the fire going to keep the house warm in the winter. After the meal, we would sing Shir Amaylot, then the men would go take a nap. Saturday night, men played cards, often at our house. The ladies came too and brought their knitting. We served apples and pears and speckulatzius cookies. They played around the big table, the first row played, and behind them there was a second row of men who did not play but watched. Uncle Karl, Salomon’s brother, and his son Siegfried were afraid to lose so they would only watch and then get very excited, the players were worried they would talk too much and reveal their cards. The stakes were 1 or 2 pfennig. During the day, on Schabbes, the young people got together and took walks. For Mincha, the community would meet again at the synagogue and then go home and do Havdallah, the children would hold the candle, then it would be blown out. There was no wine, but cider. Wine was for Pessach only. In Grosbous, however, there was a very large farm table with a round carved depression at one end. The Havdallah wine would be poured there and after the prayer the candle would be dipped in the wine to extinguish it. Saturday night, we would also go dancing. Sometimes we danced to the music of a harmonica in the bakery. There were Jewish balls in Echternach. My father could not accompany us because he had to start work at the bakery, so often Ulli and Max Levy (Bacha Max) would accompany us as escorts and my father would slip a little money in their pocket so they would not have to spend their own money. The Jewish and non-Jewish communities lived side by side without problems. We went dancing with non-Jews, we watched the cows together. The local school was Catholic, there were catechism classes, the Jews stayed in the back of the classroom and learned too. One time there was an incident. Nelly Joseph (Asuncion, Paraguay) and I were always first in the class and the teacher said one day: “Es ist eine Schande, die Jüdische Kinder immer die Ersten sind.” We reported what she said to our parents who went to the school, so she apologized that she had not meant it in a bad way and had only wanted to push the others to work harder. Non-Jews knew about our rituals, havdallah, kiddush, our maid could sing Yigdal or Shir Amaylot and knew a lot of Hebrew words. There were 2 Jews on the City Council: Salomon Mayer and Adolph Steinberger. Salomon apparently was known for snoring during the meetings. My favorite Yontef was Shavuot. The synagogue was filled with flowers, all the girls were dressed in white with a white ribbon in their hair, the weather was nice. We had a Lernen at the house of the youngest couple. Pessach Seder was held at the house of Caroline Levy, my grandmother, and my 2 unmarried aunts who lived with her, Sophie and Lena. Their house was along the Sauer, near the Hotel Hayer. The house is no longer there. Simchat Torah was a special Yontef. We would all go to synagogue in the morning and before the end of the service all the young people would sneak out and go into people’s houses to steal food. We would go in by an open back door or a window and take soup from one house, shalett from another, apfelshalett from the next and so on… Sometimes people would fix something special for us, but then sometimes people would be upset and try to keep us out of their house. I remember one year when the house was all locked up except for a small cellar window that was barely open and I, being the smallest, was sent down and I picked up all kinds of good things. We then went to the house of Leopold Levy, Gustave’s parents, where there were lots of children, and heated up everything and ate a meal all together. There were about 20 of us, young and younger in Bollendorf, but the same tradition existed in Irrel and Niederemmel. Grandfather Marx Levy died in 1917 during the Spanish Flu epidemic. He was 74. His son Bäcker Dany was in the army at the Russian front and could not come home for the funeral. His daughter Bertha was Setta and Ida’s mother, who died while giving birth to Ida. Setta was raised by Anna Schoeman Sender, sister of Caroline and mother of Hugo and Berthold Sender, from Sant Wendel. Setta eventually married Hugo Sender and they lived in Paris and manufactured raincoats. Ida was raised by her father and step-mother and married someone named Marx from Rächtig who baked Matzos. They had a daughter and came to America, but they never adapted and were unhappy; he never learned English and Ida had to work very hard all her life to feed the family. Daniel Levy, the baker, was born in Bollendorf and so was his father Marx. They lived in the house they were born in, on the street by the Sauer. It was a beautiful house with oak wood panels which opened up as closets. There was a vaulted passage to go from the front to the back of the house. The living room and the kitchen and dining room were downstairs, the bedrooms upstairs. There were 4 bedrooms, one for Marx and Caroline, one for each of the aunts, Sophie and Lena, and one that was rented out, sometimes to the Lehrer. There was a garden in the back. There was also a stable and a hay barn next to it. Marx was a cattle dealer. There was also some other land, a field further out, beyond the Burg, on the way to Echternach and another one at Mayerschuzberg, towards the Grundhof, and another on the Luxembourg side. The house always smelled of mildew because it would get flooded, two or three times a year. When the snow melted, the water level would rise, there was nothing to do, you had to wait until it receded. We knew when the water was coming. The sewing machine that Sophie used was put on the table. Once the sofa floated and ended up hanging from the banister on the stairway leading upstairs. They were well organized, though. When a flood was announced, the cow was evacuated first, using a small path in the back of the house that led up the hill. Then, Marx, Caroline and the other residents of the house would go up to the attic and then down a ladder to a wall next to the stable where the hay was thrown down, leading to the house next door. Nowadays there is a dam on the Sauer and it does not flood anymore. Caroline Schoeman Levy, Bäcker Dany ‘s mother, was a hard working woman. After Marx died, she was not well off and worked in the garden, growing vegetables, beets and potatoes, taking care of the cow for milk, maintaining an apple orchard to sell the apples to have a little income, renting a room. There was no running water in the house, it was too expensive to install it, so she had to get the water from a spring near the Sauer, where people went to wash the clothes. She died suddenly in 1924, after working in the garden; she was quite old. Two of her daughters lived with her and had not married: Sophie and Lena (Helene). They worked hard with their mother to survive, working the land and taking care of the animals, selling some milk, and the calf, and in the case of Sophie, doing some sewing for people. They got bread from the bakery, but they did not like to accept presents. Lena was very beautiful with blond hair. Sophie was not as beautiful. Lena had worked for a store in Duisburg and she had had an accident, her eardrum had been ruptured and she was deaf on one side. She had to stop working. Sophie once had a “beau” but he was a schlemiehl, and actually even worse, he was a bit mentally handicapped. Her brother Dany advised against the marriage, he said it is better to stay alone than to be stuck with a husband who is helpless. The older sisters, Bertha and Rosa and Betty, married while Marx their father was still alive, but Lena and Sophie stayed unmarried because they had no dowry. They died in concentration camp. Bella Heppenheimer lived in Hopstädten but came to Bollendorf on vacation. Helene Grumbach from Alsace came to see her grandmother Rosa Samuel. Helen Herrmann came from Cochem to see her grandparents and cousins, people traveled a little in the area, but it was time-consuming. One day, we went to visit Tante Rosa in Weiten. At 5:00 in the morning, we took the Postauto (stagecoach) to Irrel where we caught the train for the Ostbahnhof in Trier, then we crossed all of Trier on foot with our suitcase to get to the Hauptbahnhof where we got on the train to Sarrebourg, then the Postauto to Freudenburg where our cousins Hedy and Selma (Strasbourg) were waiting for us with the bicycle so that we could put the suitcase on the bike. We would arrive at 5:00 in the afternoon exhausted from a trip that was less than a hundred Kms. Fabry was a well-known character in Bollendorf. He was not Jewish. He had 16 children of all ages. He was the first one to have a bicycle. One day, as he was riding, he knocked a child down. He picks him up, makes sure he is OK and sends the kid to his mother to tell her Fabry had knocked him down. It turned out it was one of his own kids. Fabry was also involved in town meetings. Once there was a meeting to explain to villagers that there was going to be a dam and a mill on the Sauer to create electricity. People did not know what electricity was, so Fabry said: “It means you will have light.” One of the participants asked: “What if the electricity goes off?” “Then it will be dark,” replied Fabry. (Dann aset dunkel). The Jewish community of Bollendorf is no longer. Its members have emigrated or have been killed. It exists only in the memory of the survivors and in the testimonies they left us.